This book is a rich tribute to the indigenous Shilpaic tradition of the land of India and a unique work on the science of form generation and form figuration. It deals with the process of subtle energy turning into gross energy and analyses how energy itself turns into matter in this universe. Even God, the Supreme Brahman exists in a definite form at subtle level which gets manifested into material form at the hands of the Shilpi. 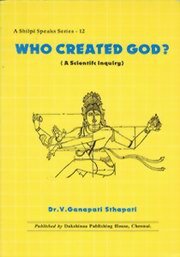 Customer Reviews of Who Created God? one of it`s kind. mahajnana. spirutual mind power of the highest order. one of it`s kind. mahajnana. spirutual mind power of the hig ..